We had a busy day yesterday, so wasn't able to get my book posts done. 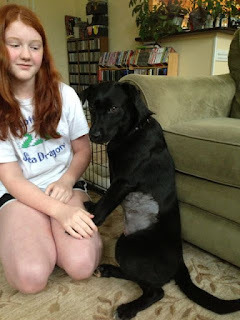 My daughter had a choir engagement that took up most of the morning and early afternoon, and then we went to collect our very first foster puppy, Lucy! Isn't she cute? All righty then, on to the books! I love how the picture wraps around the entire book. Isn't it just lovely? My grandparents gave me this book in 1980. They were tremendous readers, also. Seeing this reminds me of that, and I wish I'd asked them more about the books they enjoyed when they were still alive. This beautiful copy of Little Women by Louisa May Alcott is one of my favorites stories, and one of my most treasured books. It's illustrated by Louis Jambor. He also illustrated Jo's Boys. I did a quick Google search on him, and all I learned was that he was an American painter, born in 1884, and died in 1955. If you know anything more about him, I'd love to know! Now, as for Day 5, a book with a "green message." 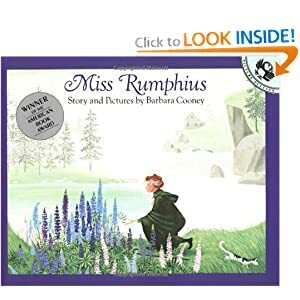 I don't know if this book is exactly green, but it's about making the world a more beautiful place: Miss Rumphius, by Barbara Cooney. Even the cover of this book is beautiful - certainly a contender for Day 4, as well. A couple other green books I could think of: The Lorax, by Dr. Seuss, and On Meadowview Street, by Henry Cole.